The small pig's organs are similar in size to those of humans and the missing genes make the organs less likely to be rejected. Variation within a litter of clones was as variable or greater than the normal litters at least 80 percent of the time for. US scientists have cloned a rare breed of pig in an experiment they say shows the copying technology can be made more efficient. The cloned animal, called Princess, was the last female in one of only four bloodlines of Gloucestershire Old Spots in North America. Several attempts at getting offspring from Princess through natural breeding and artificial insemination had failed, NewScientist.com reports. 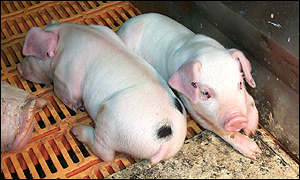 Cloning produced three piglets, born via a surrogate mother, after just one embryo implantation round.